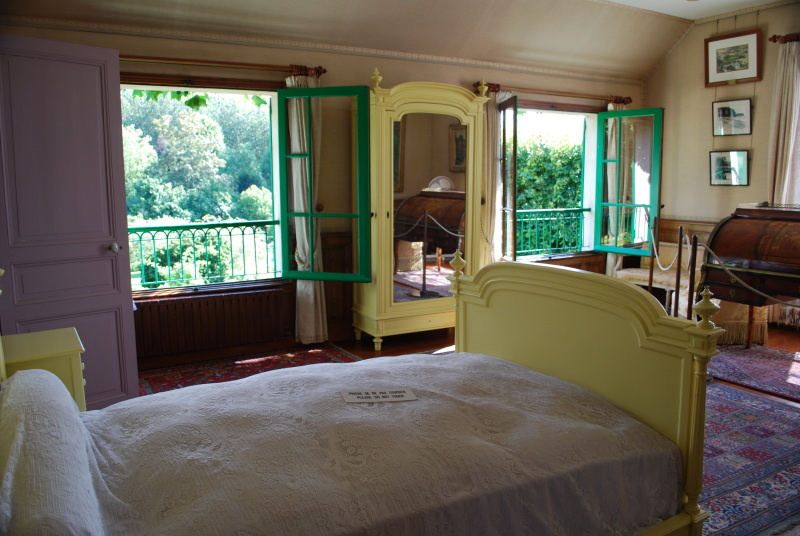 A detail strikes the visitors who enter Monet’s bedroom at Giverny: the bed is ridiculously small. Claude Monet wasn’t very tall, and he didn’t share his bed with his wife. They had separate bedrooms. Not because they didn’t care, but rich families copied the aristocracy and had separate ‘appartements’, though they were connected. Monet could get up very early without waking his wife. He loved to paint before sunrise, when the river is still covered with mist. The bed and the armoire, which were not very expensive furniture, were painted according to Monet’s taste. Monet had gorgeous views over his garden from his bedroom’s three windows. The painter designed his bedroom, he had it built just over the first studio. He wanted a lot of light in it. The bedroom was the place where he hung his collection of impressionist paintings by his friends, an incredible collection of 35 canvases including 12 paintings by Cézanne, many Renoirs, Sysleys, Morisots, Manets and so on. The desk is a beautiful antique from the 18th century. 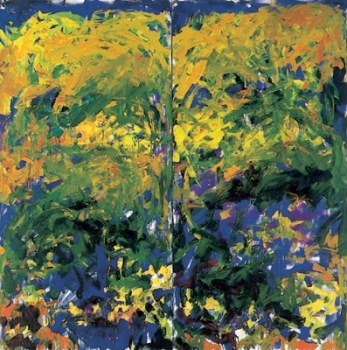 It sounds like the perfect transition for the new Museum of Impressionisms Giverny: after the first exhibition dedicated to Monet’s Nymphéas, that ended with resolutely modern late works, the next artist occupying the galleries of the museum is Joan Mitchell. Although Mitchell rarely admitted Monet’s influence on her canvases, undoubtedly she put her feet in his footsteps. She lived in the same riverscape, the Seine Valley at Vétheuil. In this village where Monet had spent a couple of very hard years, painting relentlessly, she bought the house neighboring his, almost a century later, and just like Monet she admired the beautiful natural setting. But instead of trying to recreate nature on the canvas, Mitchell, an abstract expressionist, preferred to concentrate on her own feelings. She shared with Monet an amazing energy, a fantastic talent as a colorist, a special love for oversized canvases, and more. The exhibition is on display only a few miles away from Vetheuil until 31 October, 2009 at the Musée des Impressionnismes Giverny.